"You are among the most highly esteemed and privileged. You are a partner in one of life′s most noble professions. You are the power that turns the axle that spins the wheel that moves the shaft that activates the lever that fires the steam that drives the engine. You are the engine that makes it all happen." "Everything you do in life is selling. We all sell no matter what we do for a living. That′s what I really like about this book. It′s perfect for everyone. I have 60,000 employees in my corporation. They can all use this book. Jerry has a wonderful way of telling a story. The book is easy to read, inspirational, and with just the right combination of humor and information." "Everyone in the world sells, no matter what your work or profession, so everyone will benefit greatly from Supremely Successful Selling. Practical, insightful, and just plain fun to read, it may very well be one of the most important books on selling that′s been published in recent years. "The book is a must–read. Jerry combines tips from some of the country′s leading sales people he knows and has worked with along with insights from his own rich experience. Jerry Panas presents the key that will open any door to a successful ask. "Jerry is a genius at pinpointing the single factor that ensures the sale . . . and the missing ingredient that will guarantee that you not fail. 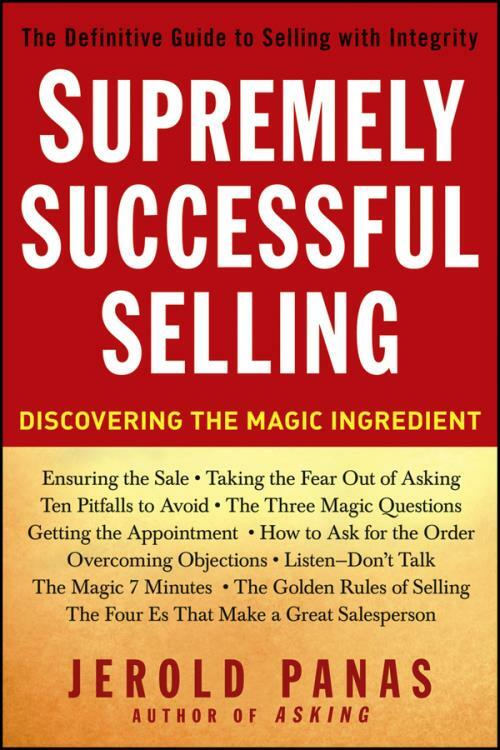 Supremely Successful Selling provides insights that propel you to success along with actual, remarkable stories that will inspire you to action."